This entry was posted on 20th June 2018 by Muireann. Why are there holes in my Rocket? 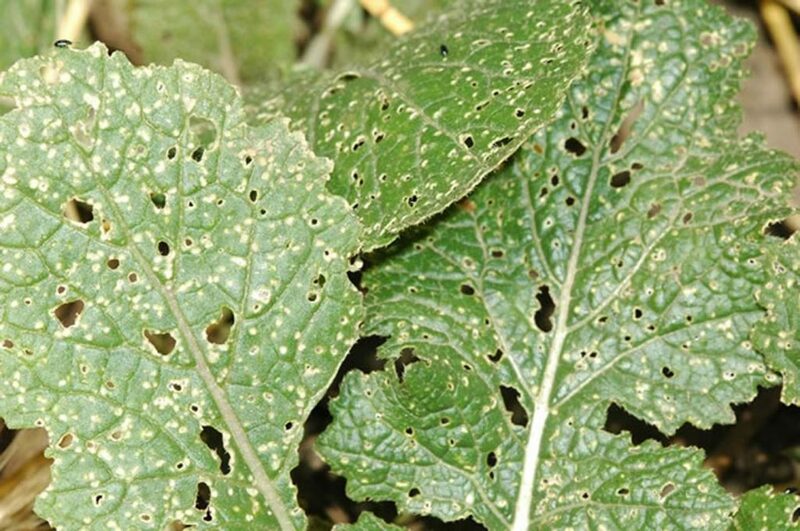 These tiny (and unsightly) holes that have appeared (often suddenly) in the leaves of young Brassica plants are the distinctive damage of the rarely seen Flea Beetle and can be very off-putting to the beginner gardener. The term Flea Beetle is used to describe a number of different species of beetles of the Chrysomelidae and they are found throughout the World. Flea Beetles are very small (usually 2- 3mm in size), shiny and oval shaped, and they can be dark blue, greenish purple or black in colour. As their name would suggest, flea beetles are jumping beetles with enlarged hind legs that allow them to jump several centimetres at a time. They are also strong fliers, moving onto plants from neighbouring fields and weedy borders. Due to their tiny nature, they’re really only the size of the head of a pin, fleas beetle are often missed in the garden so it’s important to keep an eye out for the damage that they cause, to try and catch them early. They are voracious feeders that chew numerous small holes in the leaves, giving plant leaves a distinctive lacy look. When populations are high, flea beetles can quickly defoliate plants entirely and kill many plants in an attack. They attack many different types of plants but especially love seedlings. Generally in the small garden, they cause most damage to Brassicas, also known as the cabbage family. Garden plants vulnerable to flea beetle attack include (but not limited to!) Cabbage, Broccoli, Brussels sprouts, Cauliflower, Kale, Rocket, Mizuna, Mustards, Pak Choi, Turnip and Radish. The most severe attacks occur during sunny, calm weather as the beetles feed most on sunny days and can easily fly on still days. What can I do to control Flea Beetle? Unfortunately there is no quick way to eradicate flea beetles without resorting to nasty pesticides – and no one wants to eat those! A pyrethrum spray could be used but as this spray works on contact with insects, in practice it is difficult to use because flea beetles are so small. They also have the annoying habit of jumping off the leaves of the plant when disturbed and jumping back on later! generally needs to used in tandem with other strategies. The best approach for the organic garden is a series of longer term strategies. The first thing to do is to keep the soil wet in dry, warm weather and the ground around plants well weeded. Companion plants that deter Flea Beetles can be grown between crops. For example, wormwood, thyme, catnip, and other kinds of mint cover up the scent of nearby plants. Planting a sacrificial row of ‘trap plants’ can sometimes work to attract the pests away from ‘crop plants’. Radish and turnip can be used for this purpose as the beetles damage leaves and not the part of the crop which is eaten. It can help to improve the look of your lacy Rocket. Planting flowers that encourage predators can also help in the long term. Braconid wasps and Tachinid flies produce larvae that parasitize Flea Beetle. Umbellifers such as caraway, herb fennel and coriander and Ammi majus, and other flowers such as California poppies, Calendula marigolds and yarrows can be planted between crops to attract these beneficial insects over the long term. In addition, Brassicas shouldn’t be planted out in the height summer when it is hot and dry. Young plants are particularly vulnerable so if you do want to plant them, start them in pots where it is easier to control pests. Then plant them out once they are well established and keep them well watered. 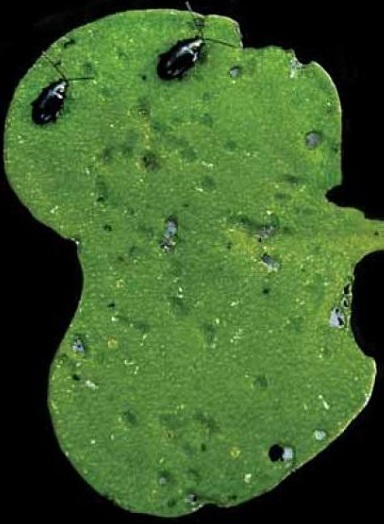 Flea Beetles overwinter in debris and grass tussocks before emerging when it warms up in the Spring. Keeping the garden tidy can help to reduce hibernating sites and therefore reduce populations for the next growing season. Unfortunately, there is no easy quick way to completely overcome this annoying pest but with a series of long-term strategies it is possible to control them and the amount of damage that they do.